Stock photography. It’s everywhere around us, and whether you realize it or not… you’ve likely used it before too in school, past jobs, or your small business. I wanted to discuss the basics of using stock photography for business, and provide some advice that will hopefully make an impact on your small business. 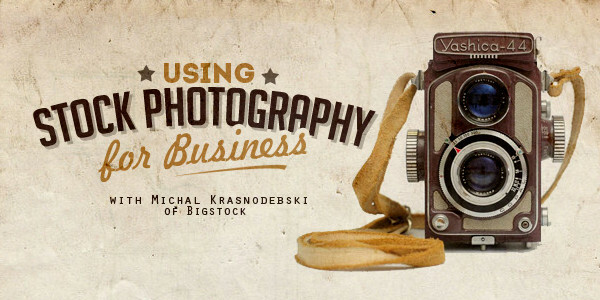 As my personal knowledge of the stock photography industry is relatively limited, I reached out to Michal Krasnodebski, GM at Bigstock. Bigstock has been in the stock photography business since 2004, and after being acquired by industry leader Shutterstock in 2009, they pushed even more of the focus on serving small business owners and marketers. What is a common misconception business owners and marketers have about the use of stock photography in their marketing materials, and social media posts? Even though the stock industry has been around for decades, we still hear from people at trade shows and conventions we attend that many entrepreneurs “grab” their images from Google. We try to educate people about the need to license photos appropriately from a stock-photo provider. It’s easy for a small business owner to treat him or herself as a small entity that a big company shouldn’t care about, or go after, but if you have dreams of scaling your business someday, these decisions early on will matter. Everyone should take these rights and restrictions seriously. It’s simply not worth the risk; it’s better to make sure you’re covered from the outset. Based on my experience, most business owners simply don’t understand they shouldn’t grab the images they use in their marketing from Google, but sometimes the reason is budget related. What are some free/cost effective ways for business owners to get imagery they can use on their website, and in their social media posts? There are plenty of websites you can pull an image from free of charge. But the quality of what you’ll find on some of those sites pales in comparison to what you’ll get from paying a relatively small amount elsewhere, as the old adage goes ‘you get what you pay for’. In addition, when you pay for an image, you are also gaining assurance that the licensing and model releases are good and that you’ll be covered in the event something happens. You’re paying for this peace of mind and can feel good knowing that the creator is also getting paid for their work. As the internet has evolved, creative industries seem to be facing a challenge when it comes to getting paid for their work. While it’s important for a small business owner to mind their budget, what do you think is the most important thing we all need to understand, when it comes to paying for creative work such as graphic design, music & photography? Remember, the contributors to stock photo sites are also small business owners themselves who deserve more than credit for their work. They should rightfully be compensated for their work. This is true in stock imagery as well as many other creative professions. What’s a common mistake small business owners & marketers make when it comes to the images they utilize for their promotional materials? Too often, people fall back on cliché or stereotypical versions of what they think they want. What they really want, or should want, is something that stands out and expresses a certain emotion. Stock photography can be whatever you make of it. Every time I’ve taken a spin through our collection, I’ve come across imagery I didn’t know existed and have marvelled at the quality of what you can uncover. Entrepreneurs are sometimes crunched for time and have to make decisions on stock imagery on the fly; we encourage people to make the effort to go the extra mile and not settle until they find the perfect image they had imagined and wanted. We know it’s in there because we’ve seen it and with 29M images to choose from you’ll find it. If you think about the best ads and posts that really caught your eye, they show off something original and inspiring. Any tips on selecting the right imagery for a website or social media post? Part of our job is educating our community about how to use stock imagery in provocative and forward-thinking ways. We publish occasional posts on our company blog listing best practices for usage, based on what we’re seeing and hearing from customers. In recent years, we have all witnessed the growth of video in marketing materials, which prompted us to decide to branch into a new business: stock video. We know how important video is for small business owners these days, and we have tried to help guide our customers with information and insights for them to grow their businesses and to develop new areas and approaches. The best advice we can champion for small business owners about choosing imagery for social media posts is to stick to your brand and maintain the vision and view of other aspects of your brand. That consistency is important because often a customer will click off from your main website and go to your Facebook page. If those two pages are radically different from one another, it can be jarring for the visitor. Make sure the imagery you choose in one place reflects what people will find in another place. Not necessarily the same image, but from the same sentiment and mindset. What has being in the stock photo industry taught you about marketing a small business? Until I worked in this industry, I never thought that much about the images or illustrations that went into campaigns or web design. I’m continually amazed by the art our contributors create and that we have in our collection. Now, I recognize our imagery out there in the world, being used every day to help people promote their products or services. When it’s a more compelling image at the forefront, I know I’m more likely to spot it, stick around and see what this business is all about. We sense that word has gotten out in recent years that imagery can help win the tough, frustrating battle for people’s attention, particularly online. Now, we’re moving to this era of reconsidering the kinds of images that connect with people and get them to share an email campaign with their friends. That’s something we think about and talk about every day. We know that small businesses like us are having similar conversations at the same time. That’s really empowering. Thank you to Michal Krasnodebski for taking time out of your busy schedule to answer some questions for local small business owners. If you’re interested in trying out Bigstock, you can click here to learn more about their 7 day free trial offer. If you have any questions about utilizing stock photography for business, please let me know. Also, I’m always looking for ideas on who I can interview for my next post. Please let me know what business challenges you face, or what kind of advice you’re looking for more of… and I’ll try to find an expert to discuss.